Though it is not unusual for ambassadors to the UN to serve short terms, it remained unclear why Haley did not complete two years and pulled out of the job before the midterm elections. She rejected speculation that she was leaving to take a run at the presidency, saying she had no plans to stand in 2020 and would be campaigning for Trump. Both the president and the outgoing envoy heaped praise on each other, to emphasise that she was not leaving on hard terms. Haley portrayed her departure as the act of a selfless public servant. “It’s important for government officials to know when to step aside,” she said, adding that it was time for someone new to take a turn. Asked about Haley’s successor, Trump said there were a “number of people” who were interested, saying that Haley had made it “a more glamorous position”. Among the possible candidates is the president’s daughter, Ivanka, and Haley went out of her way to praise her and her husband, Jared Kushner, who acts as a presidential adviser on the Middle East, and who is working on an Israel-Palestinian peace plan, though its unveiling has been delayed multiple times. “Jared is such a hidden genius that nobody understands,” Haley said, crediting him with the replacement of the Nafta trade agreement and claiming the Middle East peace plan was “unbelievably well done”. Another candidate is the former deputy national security adviser Dina Powell, who spent last weekend with Haley and their families on a boat in South Carolina. Richard Grenell, the US ambassador to Germany who spent eight years at the mission to the UN, is a third leading contender. He has maintained a high profile since moving to Berlin in May, appearing on conservative media to speak forcefully in support of Trump’s foreign policy. 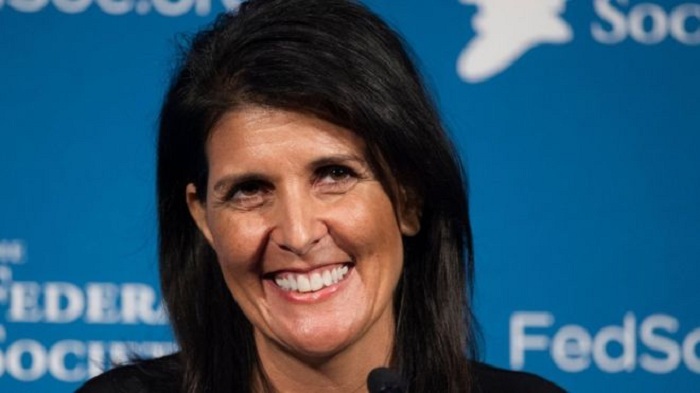 A former governor of South Carolina, Haley has been one of Trump’s most high-profile lieutenants, acting as the international face of an administration that has lacked a clear foreign policy doctrine. However, she pursued an outspoken policy direction that was sometimes at odds with the White House, particularly on the subject of Russia. While Trump has been reticent about criticising the Kremlin, Haley was a persistent, trenchant critic of Russian policy in Syria and Ukraine, and over the chemical weapon attack against a former Russian spy in the UK in March. She also spoke out on human rights issues more frequently and fervently than others in the state department. On other issues – unconditional support for Israel, unflinching hostility to Iran, North Korea and Venezuela – she was the most articulate exponent of hardline positions. Her departure will raise anxiety levels for US allies at the UN. Despite her pointed rhetoric – warning any country who voted against the US that she was “taking names” and making lists of friends and enemies – she acted as a bridge between Trump and the UN-despising Bolton. She succeeded in convincing Trump that the UN served a useful purpose for US national interests. At this year’s general assembly, the president stayed for nearly four days, taking part in multiple meetings and for the first time chairing a security council session.